On November 4, Simojovel Believing Peoples released a statement announcing the renewal of threats and attacks against the priest Marcelo Perez Perez. “As community human rights defenders, we also affirm, if anything happens to any member of the Believing Peoples, especially the threatened women and their children or our parish priest Marcelo Perez, those immediately responsible will be Ramiro Gomez Dominguez, Juan Gomez Dominguez and Cleopatra Flores del Carpio, in complicity with the State for protecting the Gomez Dominguez brothers,” they argue. In the statement they say that on November 9, Gilberto Martinez Lara, 52, was kidnapped and found dead before midday. Furthermore, they specify that on November 2, around 12:30 pm, in the middle of the celebration of the mass in the municipal cemetery of Simojovel de Allende, members of the Believing Peoples who were there realized that three people were photographing and recording the priest and his companions. “We do not know if these people really are from the government or are from organized crime; in view of the risk situation in which we live, we don’t trust suspicious actions and if these people were from the Attorney General’s Office, as we have said, they are responsible for the impunity, violence and the freedom of the Gomez Dominguez brothers,” they conclude. Around 10 am on Wednesday 4th May, between 100 and 150 people from the PRI political party and the National Campesino Confederation entered the town of Simojovel in Chiapas with much violence, firing rockets, and throwing Molotov cocktails, stones and tear gas into the streets crowded with people. They went to the Central Park where the flea market (tianguis) was set up, where people sell their amber and pozol. The denouncement was made through the Parish of San Antonio de Padua, in a release issued on Friday 6th May. The community’s view is that they sought to spread terror among the people of the town through these acts, since the attack caused panic, screams, closure of shops, parents running to schools for their children. – in the early hours of 1st April, a group of armed and masked men with machetes, guns, stones and Molotov cocktails were escorted by 5 trucks of municipal police to evict a group of parents who are demanding education for their children, leaving four people injured. – On Saturday 2nd April, around half past ten at night, Marcelo, the parish priest of that congregation was followed to a family reunion in the “Tabamex Room” in the barrio of San Sebastian; on arrival, the light was cut so that immediately afterwards, an explosive could be thrown into the room where they were celebrating 15 years. At that time, the parish facilities were raided. The people denounce that violence is starting to reign again in Simojovel, that the life of Father Marcelo Pérez Pérez is in danger, as well as the lives of several members of the Parish Council and the Pueblo Creyente. They also denounce the reactivation of armed groups by the aforementioned Gómez family. They demand that the Mexican government takes urgent measures which are necessary to restore peace in Simojovel. They hold Ramiro Gómez Domínguez and Juan Gómez Domínguez directly responsible for any action committed against Father Marcelo. They publicly rejected the invitation for dialogue from the Gomez brothers (Juan and Ramiro Gomez Dominguez), who are identified as political caciques in Simojovel, as well as being involved in the illegal sale of alcohol and weapons. The Gomez brothers oppose Father Marcelo, the parish priest of Simojovel, who has endured harassment, threats and attempted ambushes. It should be noted that Juan Gomez was mayor of Simojovel and was imprisoned in 2015 for carrying firearms for exclusive army use by the army and movement of drugs. His brother Ramiro had an arrest order and in January 2016 both cases were dismissed by the Attorney General of the State’s Office, which, according to Chiapas Paralelo “could only have happened through a process of political negotiation.” According to the statement, the Gomez brothers are campaigning for the Green Ecologist Party of Mexico (Partido Verde Ecologista de México – PVEM). Furthermore, they mentioned that a member of Community of Faith was kidnapped and interrogated to obtain information about the people who support Marcelo. Another member who was blamed for Juan Gomez’s imprisonment received threats and high calibre firearm shots have started again in the neighbourhoods. Again the time has come, the day and the hour, to come together in this sacred land. Today, 18 years and three months after the massacre in Acteal, we celebrate the commemoration of the martyrs. Only for the love of the creator of the sky and earth, we return today to see each other with all physical, moral, and spiritual presence. It is not easy to forget the cruellest acts in the history of humanity. Although the time and the hour have elapsed; the pain and the memory continue present. And each time a situation of injustice and of violence occurs in any part of the world, we feel hurt, because we are all children of GOD. A very clear and recent example is the death of the compañera, social struggler, Berta Cáceres of Honduras, as a result of a cowardly attack in her residence on March 3, 2016, where compañero Gustavo Castro Soto was injured. It seems that to defend life, people and nature is a crime. And those in charge of administering justice seem to better support and reward the great crimes against humanity, than to punish them. Our world is upside down, with the laws and the authorities protecting the criminals and prosecuting the citizens who struggle for justice. Our political constitution is out of date because the president of the republic continues to make reforms that do not benefit the Mexican people. They only benefit the rich and foreign companies. And the Mexican people whose rights they violate only receive crumbs and repression. Our previous constitution was well established; it reflected individual and social rights like the right of the campesinxs to the land, because that constitution was made with the sacrifice of our grandfathers who gave their lives and blood during the Mexican Revolution. We are very sorry that the rulers never had in hand the history of our country. They do not know the meaning of our national flag, or which rights are enshrined in our constitution. Those rulers have completely trampled and forgotten it; they never take into account the people that gave their life for it. All of those that rise up to defend and protest for their rights are met with the same response from the government: repression, assassination and imprisonment. A clear example of this is the young students of Ayotzinapa who were disappeared. The families of these young people have continued for a year and a half to demand justice and the return of their children alive, but the authorities do not want to heed the cry of the people. 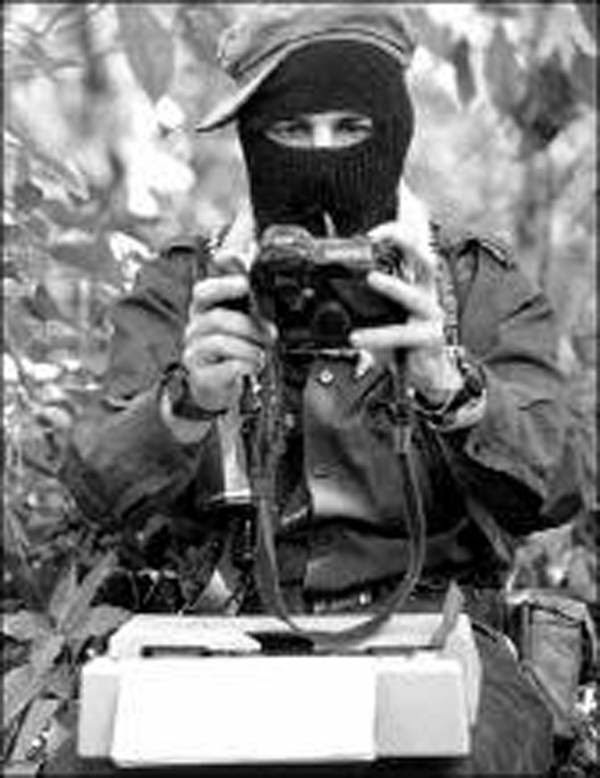 Ultimately, the reason is that they will not judge and condemn their own actions; that is very clear, it is the same thing that happened here in Acteal: they continue to misrepresent the facts of what happened on 22nd December, 1997, because they themselves designed and planned the counterinsurgency, they financed and trained the paramilitaries. And also they gave freedom to the assassins although they were already sentenced and had confessed to these cruel events in Acteal. Perhaps the rulers do not think of the direction that leads to justice and the direction that our country takes. Today the people are tired and very desperate because there is no justice and because there is no peace in our country. We are an organization which always proclaims the truth and at the same time, denounces the violent acts in our country because our mission and our commitment is to work for peace. To love one another as our Priest (Father) has taught us, but thanks to the prophets who announced the truth and denounced all mortal sins which carry us to perdition. Today we also thank Father Marcelo Pérez from the indigenous Tzotzil region, who is committed to the struggle for life of the people of Simojovel who are threatened by so much violence, by the trafficking of drugs, by alcoholism, prostitution, the trafficking of arms and even the buying of consciences to make them abandon this dignified struggle. We, as the authentic Abejas of Acteal join the struggle for the life of the people that we all long for, not only in Simojovel but in many parts of the world, we stand in solidarity with all of those who suffer and struggle for another possible world. Brothers and sister, we call on you to take up a peaceful struggle because violence does not bring life. We hope to march together until peace triumphs. Close to a thousand residents of La Pimienta, Simojovel municipality, Chiapas, occupied City Hall and marched in protest due to the failure of justice for the deaths of two infants and the sequelae suffered by another 29 following the application of expired immunizations by the Mexican Institute for Social Insurance (IMSS) last May. After six months of failure to observe the accords, residents of La Pimienta mobilized to express their repudiation of the Chiapas state governor, Manuel Velasco Coello, as well as the mass media, “because they have offended and hurt us, beyond attacking our human dignity, by assuring that the authorities have in fact observed their word. For this reason we call on the government to implement its agreements, but above all to guarantee the health of the 29 infants and to compensate damages incurred,” noted the spokespeople. Residents of the community of La Pimienta, in the municipality of Simojovel, where, in May, two children died and 29 more were poisoned as a result of vaccinations applied by the IMSS, marched in that city in protest at the failure to fulfil various agreements. Over a thousand people participated in the demonstration, which ended with a rally outside the Town Hall where they set up an indefinite sit-in, local sources report. In a letter, the families of the babies affected by the injection revealed that the survivors are exhibiting symptoms as a consequence of what happened and have not yet received the care promised by the government when the incident took place. The parents of the children demanded lifelong healthcare for their children. They pointed out that although the authorities undertook to rehabilitate the clinic in the community, supply it with medicines and donate an ambulance, this has not happened. They stated that people still have to go to private services in the municipal headquarters. They claimed that, after what happened in their community, there was also a commitment made to finish paving the road from La Pimienta to the municipal headquarters, as well as to the construction of two vehicular bridges and the restoration of two classrooms and recreational areas in different educational institutions. Seven months after the tragedy, they said, these commitments have not been fulfilled. “Today we went out to inform the public and to demand that the government comply with the [commitments in] the minutes of government,” they stressed. On 3 November by means of a public denunciation, the Believing People from the San Antonio de Pádua parish in Simojovel expressed gratitude for the accompaniment by all those who have walked beside them, reviewing the different meetings of the past few months as well as the mass-pilgrimage from Simojovel to Tuxtla Gutierrez.